No, sorry, I'm not selling electric cars here! I'm just going to tell you stuff about electric cars for sale, and where you can find electric cars for sale – so you can go test drive, ask the right questions, and drive home happy. All the bits and bobs work in perfect harmony. The Guess-O-Meter (more on that later) gives you a pretty good idea of how many miles you have left before you have to charge. The car won't go into gear if you're still plugged in (yes, this feature was developed just for me, probably, sigh). The battery pack is under warranty and therefore not your problem. It's got financing like every other car out there. Even more fantastic is that you can get a LEAF that's a few years old for a song. It's still an awesome car, just maybe not the latest and greatest version. It might have some flaws that the latest version does not have. It might lack some features you'd miss. But on the other hand it's super reliable, even with a few years and miles on it! We will be talking about the three top selling electric cars in the US here - the Tesla Model 3, the Nissan LEAF, and the Chevy Bolt - though there are other very worthy electric cars now on the market that I really like too, such as the BMW i3, the Volkswagen e-Golf and the Kia Soul EV. So with that, let's get right to it! 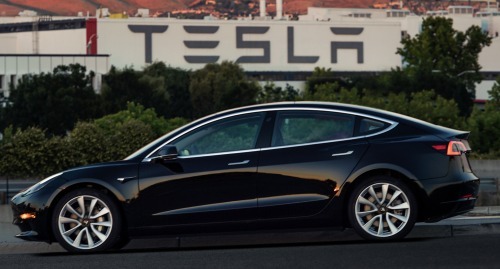 Tesla Model 3: Because who can resist? The Tesla Model 3 is here now, pretty much (Fall, 2018), and it is a genuine article high-quality Tesla, and the base price is 35k. What, Lynne? Did you say I can get a Tesla for 35k?? Why are we still sitting here? Sign me up!! Yeah...that's where it gets complicated. As of now, yes, the base price is 35k...but. The stripped-down version of the Model 3 is not actually available at the moment, because Tesla began production with the 50k-ish version, which has a lot more bells and whistles, as you'd expect. 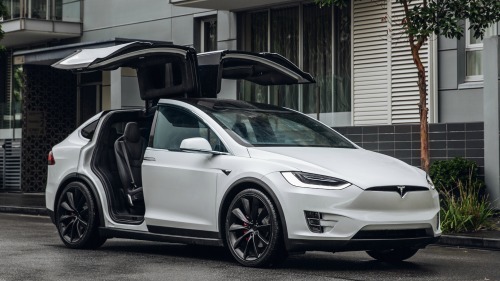 ...and of course, you can head on over to my Tesla page to read more about all three of Tesla's electric car offerings. 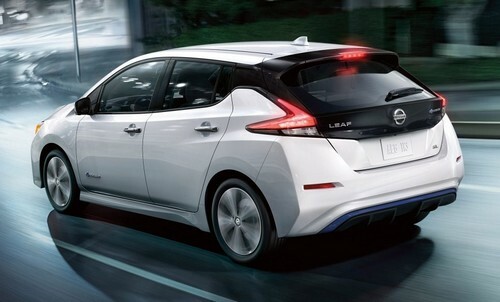 Meet the new 2019 Nissan LEAF! It sure looks different now, doesn't it? Besides the Tesla Roadster, the Nissan LEAF was the first 100% electric car since the 1990's to be produced by the major automakers and available for sale in the US. My Uncle Chuck bought one of these just as soon as they became available; I interviewed him about his Nissan LEAF and his complete lack of range anxiety, and he told me a very interesting story about how he powers his LEAF with solar panels on his roof. A lot of LEAF owners are putting up solar panels these days! That's basically "free fuel for life", and Nissan is working to make this even easier for future LEAF owners. This is a low cost, high quality electric car. It's not a Tesla, but nothing inside it is cheaply constructed, either. Don't get me started. Anyway. From 2011 to 2016, the battery pack capacity was 24kWh, which gives you 100 theoretical miles of charge before you have to plug in and start over. Then in the 2017 model year, the capacity was increased to 30kWh, and now it is 40kWh. On your dash display, right hand side, you will see the number of miles your LEAF believes you have available to travel before you will have to recharge. It is never accurate. Not because Carwings wants to lie to you and leave you stranded - and laugh - but because the computer is only making a guess based on your last several miles and driving conditions. Hot day? Cold day? Huge hill? Windy conditions? Low tire pressure? Junk in the trunk (or hatch, whatever that storage area is called)? All that will affect the GOM's forecast, for various reasons. When I first got my LEAF (that's my silver 2013 in the photo), I paid waaay too much attention to the GOM and it gave me nothing but anxiety and grief. Eventually, a few months into ownership, I learned to switch over to the “State of Charge” screen (you can change your display by pushing a button over on the left side of the steering column) which displays the “battery percent” status, starting with 100% as you leave the house in the morning and decreasing slowly as you drive. Your brain becomes your GOM, which I find is a LOT more accurate than Carwings...and you can make adjustments if needed in real time, decreasing speed, using hypermiling techniques, turning off the cabin heat in favor of the seat and steering wheel heat in order to stretch your mileage. Okay, friends, what the heck was Chevy thinking, naming their electric car the Bolt after calling the hybrid the Volt?? But yes, they are two different cars. The Volt is a very nice extended range electric car, which, once you own it, you'll never want to put gas into. You can drive it apparently 1000 miles or more between gas fill-ups. 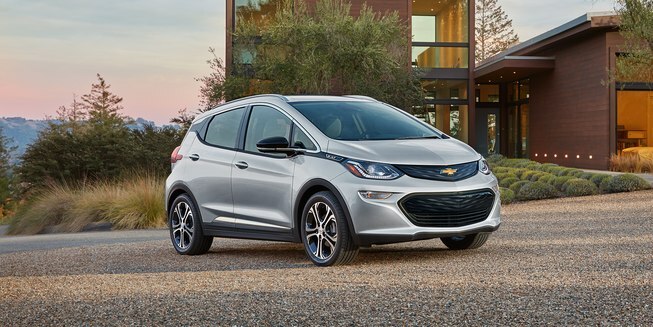 So Chevy brought out the Bolt last year, and it is also a very nice little car (the Volt is mid-sized and heavier) in the hatchback design, looking a bit like the LEAF in profile only smaller, with a huge electric range – 230-some miles with a big 60kWh battery pack. At 35-40k, it's very affordable, too. LEAF better watch out. Nissan has finally come out with a 40kWh pack in their 2019 LEAF, and in the meantime let Chevy walk off with their EV customers who were ready to trade in their leases last year? Hm. Don't get me wrong, I love my LEAF. But 200+ miles of range for 35k? That's pretty attractive. You can read a comparison of all three of these top selling electric cars here. Spoiler: the author liked the Tesla Model 3. A lot.